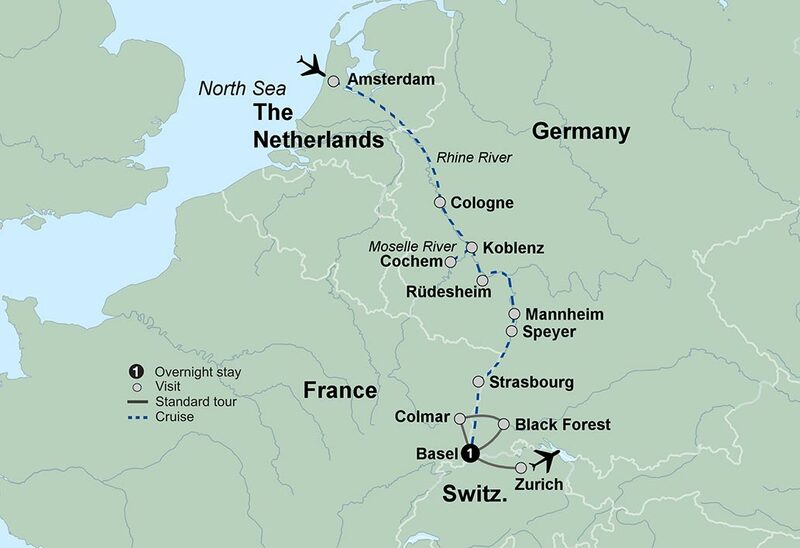 Set sail on a cruise along the Rhine and Moselle rivers that will take you to Netherlands, Germany and France. Sit back and relax in your outside stateroom and enjoy the luxury of unlimited wine or beer with every dinner and daily onboard musical performances. Join a local expert for a tour of Amsterdam highlighting the city’s centuries-old canal system and famous 16th-century row houses stacked side-by-side. Spend time in Speyer, one of Germany’s oldest cities. Pause in Rüdesheim to explore the famous Siegfried’s Mechaniches Musikkabinett (or Music Museum). Tour the 2,000-year-old city of Koblenz. Your stop in Cologne features a guided walking tour of the city’s old town and Cologne Cathedral. Spend the afternoon in Cochem and sip wine in one of the famous cellars. Enjoy a guided tour of the world famous Strasbourg old town. Step back in time on a walking tour of Colmar, France. Savor a dinner of regional Black Forest specialties and a demonstration of traditional cuckoo clock making in Titisee, Germany. This cruise will bring you by charming panoramas while you get to know the interesting culture and deep history of the region. Cruise the famous canals of Amsterdam. Discover the lovely town of Cochem on a guided tour. Take in the sounds of barrel organs and medieval instruments at Siegfried’s Mechanisches Musikkabinett. Set out on a tour of picturesque Rüdesheim. Your tour opens in Amsterdam where you will board your cruise ship for a 7-night cruise along the Rhine River. Your ship offers an array of amenities including outside staterooms, unlimited wine with every dinner, and daily onboard musical performances. Today, join a local expert for a city tour of Amsterdam including a cruise along the city’s centuries-old canal system. Board your canal boat and cruise by charming cafés and famous 16th-century row houses stacked side-by-side. As you glide down the river this morning, pass through the picturesque German landscape dotted with medieval towns. Your journey brings you to Cologne where you will join a guide for a walking tour of the city’s Old Town with its narrow, cobbled streets. Admire the Cologne Cathedral, as well as the Roman Dionysus mosaic and the Romanesque church of St. Martin. Set sail on the Moselle River to Cochem where you will join a guided tour through this lovely town and Reichsburg Castle. The castle is set on a precipitous rock high above the town and offers breathtaking views of the Moselle Valley. End your tour of Cochem with a visit and introduction by a local winemaker to one of Cochem’s wine cellars where you will taste regional Mosel wines. Continue on to Koblenz and get to know this 2,000-year-old city on a walking tour. See such sights as the town’s old quarter, which was badly damaged during World War II and then rebuilt, as well as the Schaengel Fountain at the town hall. Your next stop is Rüdesheim. Set out on a tour of the city and its famous Siegfried’s Mechanisches Musikkabinett (or Mechanical Music Museum) where you will be treated to the music of barrel organs and medieval mechanical instruments. The river takes you to Mannheim where you will have free time to explore the city on your own. Or, perhaps you will join an optional excursion to the town of Heidelberg. Later, sail to Speyer, one of Germany’s oldest cities, and step back in time on a walking tour to explore such places as the Old Gate and the Jewish baths. A wonderful evening of food, music and entertainment awaits you at the Captain's Gala Dinner. Your journey takes you to Strasbourg, a provincial capital of France that blends centuries of Roman, French, German and Alsatian influences together, creating a unique character. Discover the history of the city on a guided tour of the old quarter, "Petite France," featuring the Cathedral of Notre Dame. Highlights also include Place de la République and Place d’Austerlitz. You will have free time to explore this perfectly preserved town before returning to your cruise ship. Today is filled with exploration! Disembark your ship in Basel and travel to the Alsace wine region to spend time in beautiful Colmar. Step back in time with a local guide on a walking tour of the Old Town highlighting its many architectural landmarks. Enjoy some free time to explore this charming city on your own. Next, drive to Titisee, a German resort town nestled alongside its picturesque lake hidden deep in the Black Forest. Savor some leisure time to browse the shops for the region’s famous cuckoo clocks. Prior to dinner you’ll have an opportunity to meet a local artisan who demonstrates how these cuckoo clocks are made with traditional techniques. Then, enjoy a dinner of Black Forest regional specialties before returning to your hotel in Basel. *Rate is per person, land only, double occupancy, tour inclusions and available options may vary based on departure date.